GTKTerm2 is a lightweight tabbed terminal emulator for GTK2. 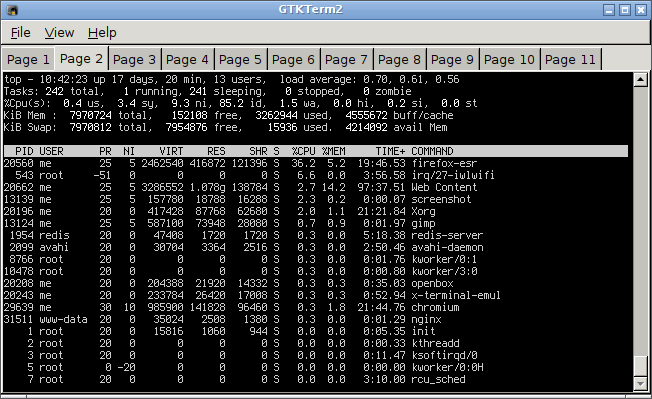 GTKTerm2 has a FreeBSD port. The source tree has Debian package building scripts, however at this time there are no pre-built Debian packages for GTKTerm2. GTKTerm2 reads ~/.gtkterm2rc for its configuration information. If this file does not exist, it will be created by GTKTerm2 during the first run. Most settings in a .gtkterm2rc, like this sample file, are self-explanatory. The color definition is a little tricky. There are 18 numbers for each of red, grn and blu lines corresponding to the default background color, default foreground color, followed by the l16 ANSI colors](https://gist.github.com/chrisopedia/8754917): black, red, green, yellow, blue, purple, cyan, white, bold black, bold red, bold green, bold yellow, bold blue, bold purple, bold cyan and bold white. Each number represents the color in RGBA format. GTKTerm2 is licensed under GPL v2.